An eclectic array of guest came out for the inaugural MAK Games, a “tennis invitational” to benefit the art-and-architecture think tank the MAK Center at the Sheats Goldstein Residence, the architect John Lautner’s Modernist masterpiece in Beverly Hills. The event, chaired by Los Angeles County Museum of Art’s in-house architect Priscilla Fraser and the gallerist Esther Kim Varet, drew the artists Charles Gaines and Friedrich Kunath; Ben Goldhirsch, the founder of the activist community Good; and the fashion designer Minnie Mortimer, a member of the host committee. The writer-director Stephen Gaghan, Mortimer’s husband, and the producer Brian Burton (a k a Danger Mouse), who are longtime friends, were doubles partners. Doug Aitken, back in town after his Station to Station tour, swung by for the final match. 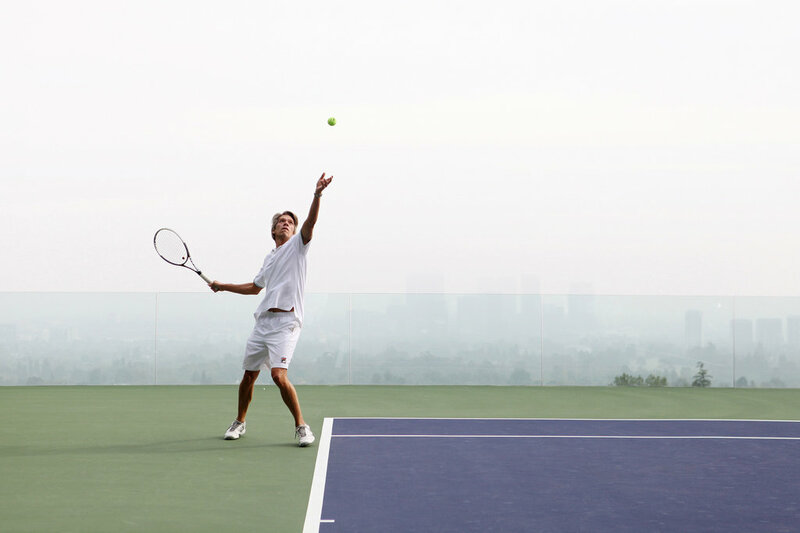 Why are so many architects tennis fanatics? “There’s something about the geometry and physics,” said Kimberli Meyer, director of the MAK Center. The Tennis Channel commentator Justin Gimelstob and Tony Graham, the house’s Director of Tennis (his actual title), traded referee duties, as the players competed in abbreviated doubles matches. Occasionally they turned to the cocktail-sipping courtside crowd to confirm the score. Gaghan and Burton admitted they had more experience playing Ping-Pong together than tennis. “I’m just glad my dad isn’t watching,” Burton said. Nonetheless, the two took home the trophy, a minimalist chrome tennis ball created by Duncan Nicholson, a Lautner protégé, who also designed the just-finished court and the yet-to-be-completed nightclub below it. “Honestly, it’s embarrassing how good it feels,” Gaghan said afterward with a grin. Part of the event’s appeal was the chance to tour the concrete-and-glass fortress best known as Jackie Treehorn’s place in “The Big Lebowski.” Built in 1963, the house was purchased in 1972 by the flamboyant investor (and front-row fixture at Lakers games and fashion-week events) James Goldstein, who worked with Lautner to remodel it until the architect’s death in 1994. Some guests ventured down a steep flight of stairs to experience “Above Horizon,” a “skyspace” by James Turrell that was installed in 2004. “This is certainly the quintessential L.A. home,” the architect Ron Radziner said. The games kicked off at 3 in the afternoon last Saturday while DJ Roisin Davis played breezy party tracks from Shuggie Otis, Daft Punk and Françoise Hardy. As the afternoon wore on, the referees urged players to keep things moving. As it turned out, the new court had no lights. The MAK Center, which operates three historic properties — most notably the Schindler House in West Hollywood, which serves as its headquarters — is a critical incubator for art and architecture in Southern California. The center offers residencies, events and exhibitions, like the current tribute to the architect Rudoph Schindler’s radical bohemian wife, Pauline. Previous postRock Star Irene Neuwirth Next postAldous Huxley's Brave New L.A.